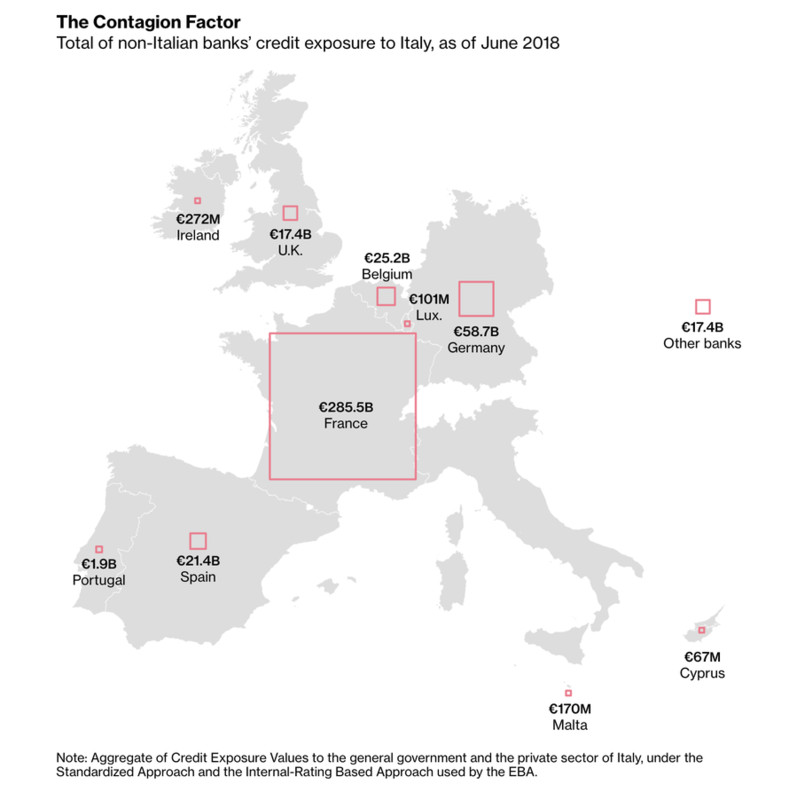 Italy’s $1.7 trillion pile of public debt – the third largest sovereign debt pool in Europe – is threatening to set off a chain reaction that could hammer banks from Rome, to Madrid, to Frankfurt – and beyond. Plagued by another run of bank bailouts and simmering tensions between the partners in its ruling coalition, Italy’s brief reprieve following the detente between its populist rulers and angry bureaucrats in Brussels is already beginning to fade. As Bloomberg reminded us on Monday, Italy’s $1.7 trillion pile of public debt – the third largest sovereign debt pool in Europe – is threatening to set off a chain reaction that could hammer banks from Rome, to Madrid, to Frankfurt – and beyond. Just the mention of the precarity of Italian debt markets “can induce a shudder of financial fear like no other” in bureaucrats and businessmen alike – particularly after Italy’s economy slid into a recession during Q4. While much of Italy’s debt burden is held by its banks and private citizens, lenders outside of Italy are holding some 425 billion euros ($486 billion) in public and private debt.